Are Electric Bikes Any Good? And Are They Worth Buying? What Is All The Fuss About For E-Bikes? Electric bikes, otherwise known as e-bikes, are rapidly growing in popularity across the world right now. Many of us, however, are struggling to see why you would opt for an e-bike over a traditional push bike or a motorbike. An e-bike is a halfway house between the two, but why is this beneficial? First of all, let’s take a look at exactly what an e-bike entails. E-bikes are electric bicycles which provide power-assisted travel through an integrated motor which is attached to the frame. In the UK, there are certain specifications which define an e-bike, referred to by law as an ‘electrically assisted pedal cycle’, or EAPC. For an e-bike to classify as an EAPC, it must be pedal-assisted, have a maximum output of 250 watts and only provide motor-assisted travel up to a speed of 15.5 miles per hour. Anything above this will legally be classified – and come with all the same rules and restrictions – as a motorbike. Save Money: Similar to push bikes, e-bikes are a great money-saving mode of travel. Unlike a car or motorbike, they have minimal running costs and are easy to upkeep at the simple charge of a battery, meaning no pesky fuel costs or MOTs. You can save a dizzying amount on parking charges too. Less Paperwork: Furthermore, if they fall within the assigned government specifications, e-bikes do not need to be taxed or registered, making them a far simpler and more cost-efficient option than a motorbike. No Licence: In addition, no licence is required to drive an e-bike, making them a great option for those who are unwilling or unable to take their driving test. Speed: E-bikes provide unparalleled power assisted travel, allowing you to reach far greater speeds with far less effort than a standard bike. If you live in a hilly area, this is particularly useful as you can ascend steep inclines with ease. City Travel: Most e-bikes can travel up to 15.5 miles per hour – the legal limit for motorised bicycles in the UK. This is a very reasonable speed that close to matches the average speed that a car travels in large cities such as London. In addition, the ability to use the cycle lane means that you can beat the traffic at top speed. Country Travel: If you want to avoid busy roads on your commute, then an e-bike is also a great choice. Being permitted to travel on backroads and country paths offers a refreshing alternative, whilst the motorised function means that you won’t lose any of the speed of road travel. Fitness: Although e-bikes do offer motor assistance with your travel, you can still enjoy many of the great health benefits of cycling. With most bikes coming equipped with a range of settings, you can adjust your output according to your needs. This makes them a preferable option to a motorbike for those hoping to burn some calories on their commute, with the added benefit of saving you on that monthly gym pass. Mobility: E-bikes also provide an excellent way for those whose health or mobility is failing to get back on the cycle track, as it provides people with complaints such as asthma or joint problems the added push they need to be able to cycle comfortably. Comfortability: Cycling to work can not only be tiring, it can also result in sweat-soaked clothes, making for an uncomfortable day ahead. By opting for an e-bike, you can get all of the great benefits of cycling without quite so much perspiration. Environmentally Friendly: On top of all this, e-bikes also come with environmental benefits when compared to a car or motorbike, as they do not release harmful emissions into the atmosphere. Low Age Restriction: In the UK, it is legal to drive an e-bike from the age of 14, making it an excellent option for younger people who want a quicker way of getting from A to B. Now we’ve had a look at the many benefits of e-bikes, you’re probably wondering “what’s not to like?”. Well, whilst the benefits certainly outweigh the disadvantages, there are nevertheless some drawbacks to owning an e-bike. Recharging Time: One of the key drawbacks to e-bikes is the time required to recharge them. Whilst battery life varies wildly between models, recharging time typically falls between 3-6 hours, meaning you could be stuck for quite a while if the battery dies at an inopportune moment. Heavy: Due to their inbuilt motor, e-bikes are far heavier than traditional bicycles, making them all the more cumbersome if the battery fails when you’re still on your way to your destination. Noisy: When compared to a traditional bicycle, an e-bike is much louder as a result of the motor. Although this may not be problematic on a busy road, it could spoil the peace on a quieter country trail. High Initial Cost: Generally speaking, you can get a push bike for far cheaper than an e-bike. For the better models, the initial cost to buy an e-bike is very high when compared to a lower-end push bike. Decent models start at £1000, with more preferable higher-end models reaching upwards of £3000-4000, meaning that many people are priced out of ownership. 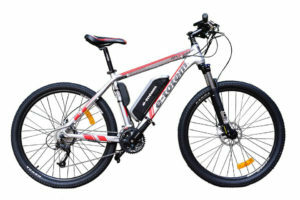 Legal Restrictions: The legal restrictions placed on e-bikes by the government mean that they cannot travel as fast as they might, and only lower spec models fall within the legal category of “e-bike”. Those which exceed the legal restrictions will automatically be classed in the same category as motorbikes and come with all of the same disadvantages. More Vulnerable to Theft: When compared to traditional bicycles, e-bikes are more vulnerable to theft due to their value, making it less safe to leave them parked in public places. Models Vary Widely: If you have a lot of money to spend, you can find a high-end reliable e-bike with ease. Lower cost models on the other hand can be a bit of a gamble, with parts proving difficult to replace when breakages occur. So, Are They Worth It? Now for the ultimate question: are they really worth it? If you’re searching for an alternative mode of transport to a car that will improve your fitness but also get you places fast, then an e-bike is a great option. With the added benefit of being environmentally friendly, they also offer you the chance to work on your carbon footprint. However, whilst an e-bike can stand to save you a good amount of cash in the long run, the initial cost for a decent model is no small fry. If you can afford to fork out the money to purchase an e-bike, then the likelihood is that you’ll see a return in your investment within a year when compared with a car or motorbike. The parking and petrol costs alone can easily add up to the price of a lower end e-bike over the course of a year, making it well worth it. On the other hand, if you don’t have the money, then the truth is that an e-bike is not an essential item. It may be worth leaning on that reliable old push bike for just a little longer and saving up for an e-bike rather than breaking the bank on one right away. All in all, dependent on what your looking for, e-bikes are certainly worth the money considering their many great benefits. What Is the Law for Motorised / Electric Bikes in the UK? What Are the Best Types of E-Bikes for Commuting & Why?